Happy New Year, y’all! Today’s post will be (very) mini-reviews of some 2011 fragrances that I didn’t get a chance to review last year. Were there any perfumes that you were looking forward to in 2011 that you somehow missed? Pacifica Island Vanilla: A very boozy vanilla. Not my thing, but a very inexpensive alternative for fans of boozy vanilla fragrances. Thierry Mugler Angel Gout de Parfum: The cocoa note in this new version of Angel is fabulous. It smells just like baker’s chocolate (which is to say, distinctly cocoa without being at all sweet). However, it is still just a bit too Angel-y for me. Bottega Veneta Eau de Parfum: A very pretty, civilized floral leather scent. 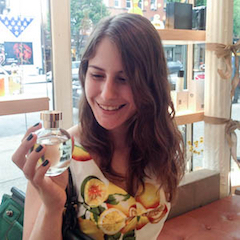 This was widely beloved by perfume bloggers, but I found it a bit sweet. Apparently I like my leather perfumes the way I like my Harrison Ford: rough-and-tumble. Chanel No. 19 Poudre: Opens with a beautiful iris note, then just sort of peters out after 30 minutes. Much better on paper than on skin, where it became distinctly unappealing. Prada Infusion de Rose: This one didn’t do very well, but I found it quite enjoyable. Infusion de Rose is a tasty combination of rose, mint and honey that reminds me very much of the delectable Sweet Leaf Mint and Honey iced tea. Pretty and refreshing. Bond No. 9 Andy Warhol: A very loud rose-and-patchouli fragrance. I don’t particularly like this combination, but even if I did, there are much cheaper perfumes in this vein. ‹ PreviousScents of Self’s New Year’s Resolutions! 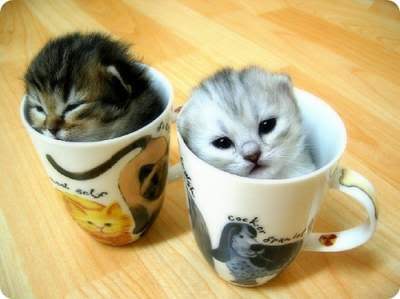 And if you are not careful, I will STEAL YOUR ADORABLE KITTENS IN MUGS OMGOMG THEY ARE SO CUTE I COULD EAT THEM UP NOSE TO TAIL! I am going to have to do mini-reviews of a lot of things instead of trying to go full-out on scents that did not wow me. Ooh, there’s a resolution I can keep: less pressure on self over Dumb Stuff. I didn’t love Bottega Veneta – although I like it and I think it is well done, it has a raspiness that is just Killing Me. Plus that patchouli. Also found No. 19 Poudre just, well, dulllllllllll. None of the Amazonian confidence the original has. They are THE CUTEST. Please steal them and apply the picture judiciously whenever the occasion calls for it. I wholeheartedly endorse your resolution and am looking forward to your mini-reviews!! Question, though: is there any other way to GET Harrison Ford, other than rough-and-tumble? And another: If you’ve seen The Fugitive, would you pick Harrison or Tommy Lee? I ask because my husband and brother-in-law (CEO’s sister’s husband K, who was CEO’s college roommate) once rented it, eons ago, as a double-date movie. Their rationale was that the girls would certainly enjoy Harrison Ford, while the guys would enjoy the chase scenes. E and I looked at each other and said, without missing a beat, “Nope, not Harrison. Tommy Lee is way sexier.” They goggled at us. Srsly. If Mrs. Jones ever ditches the guy, I’d probably crawl six miles a’ bad road to go out with that man. Whoo. You know, I love Tommy Lee Jones, but I just don’t think of him as attractive. Since the first movie that I saw him in was Men in Black, the image I have of him is that of a grumpy old guy. But maybe my opinion would change if I saw The Fugitive! Curiously I always felt exactly the same with Tommy Lee Jones, but something has changed lately – don’t ask me why, but now I see him extremely attractive in all those films of the 90’s, even in some recent/past movies. That’s probably a sign that I’m getting older? HF: I didn’t kill my wife! I like your new layout 🙂 🙂 A LOT ! PS: HappyHappyHappy New Year to my dearissimaaaaa Arielleeee! and to everybody! Thank you, Gemma! Happy New Year to you too!!! !